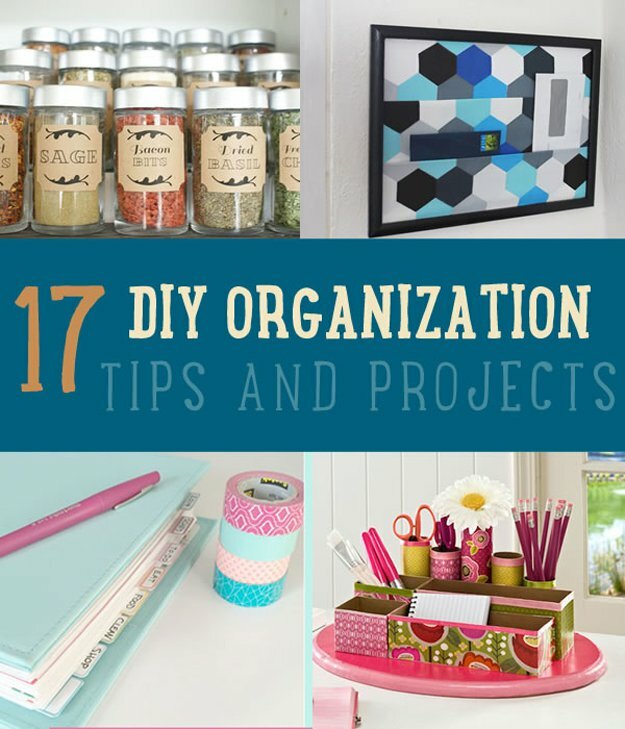 Looking for some new DIY organizing ideas and DIY organizing projects to make order of things in your life? We've had a lot of New Years that have passed where we vowed to be more organized but never do. Make this year different with our organization tips and projects you can try for your kitchen, bedroom and pretty much everything around the house. Get a fresh start this year with a well kept home that will radiate in all aspects of your life! From DIY closet organization to DIY kitchen and pantry organization solutions, we have you covered. Get organized in 2015 with these easy DIY ideas that will help you put everything in its place in no time. Do you get surprised when you get a final notice in the mail because you've lost a bill? Don't let that happen with this DIY mail organizer. Click here for the tutorial! 2. Make a DIY Planner! Got a planner you never use? Maybe it's only because it doesn't have what you need to really plan what you want to do. Make this DIY life planner and get your year organized! Click here for the instructions! 3. Get Your Pet Organized Too! Make this treat and leash wall hanger to keep your pet's needs at your finger tips. Not only will it look fashionable, it's also a good pet project to try. Click here for the step-by-step! 4. Organize Your Spice Rack! If you love to cook with spices, this would be the best organization tip for you. It's easy and also budget-friendly! Click here to see how! 5. Make a Hidden Storage for Your Little Trinkets! Keep your precious belongings hidden in one spot with this organization idea you can make from old books. Click here for the tutorial! Is your closet overflowing with clothes? Check this quick guide on what to do with all of that, this is a great organizing idea. 7. Have All Your Vanity Needs in One Tray! If you're constantly trying to find your beauty supplies, it may be time for you to make this DIY project. Click here for the full tutorial! A great organizing idea you can try for your laundry. Just don't forget to put the baskets back in their right place. Check it out here! Doesn't it make more sense that your broom closet looks tidy, you use it for cleaning after all, right? Here's a DIY organization idea you can try. Click here to read more! All you need are some wire shelves and plastic storage boxes and you'll be set. Click here to check it out! Make this easy DIY jewelry organizer and have everything stylishly organized in your room. Click here for the tutorial! 12. Organize your Supplies Under the Sink! When was the last time you thought about all the supplies you store under your sink? Here's an awesome organization idea you can try. Click here to check it out! Try this DIY organization by using toilet paper rolls and cardboard. It's a great way to have your desk organized in no time. Click here for the tutorial! Don't let your accessories lying around. No one wants to play a hide-and-seek game every time you need to accessorize. Try this DIY organization idea, click here for the tutorial! With all the DIYs and craft projects you're doing, it's always best to keep your craft room organized too. Click here to see more! This is such a brilliant organizing tip you should try. Click here to see how! If you have an old bookshelf that's just catching cobwebs, make this storage idea. Click here to see the tutorial! Did you enjoy our DIY organization ideas? Let us know in the comments section below what your thoughts are on these organizing tips. Do you have any other stprage ideas you’d like to share? Share it with us and we’ll give it a try. We love doing cool DIY projects by making craft projects, home decor projects, upcycling ideas, recipes, tutorials and anything you can do yourself. That’s why we created this site, we want people to be more in touch with their creative side and realize that there’s a lot of things that they can do themselves. We’d love to hear from you and create a community of DIY enthusiasts where any project is just a click away. Stay connected with us on Facebook, Twitter, Pinterest and Instagram! Just wanted to say I enjoyed your post. Very helpful. Thanks.